If you rolled into Melbourne’s Forum Theatre early enough, Publique were there warming up the room. The five-piece from Sydney delivered a sweltering half-hour set of post-punk. New single, “Deprecate,” was a highlight of their set, seeing the band experimenting a touch with their signature sound. They had me enamored for the short time they had the stage. Publique certainly didn’t appeal to all members in the crowd, as a few rude patrons demonstrated, but I believe they’re brimming with potential. In a few years time, Publique could be Australia’s answer to IDLES, the formidable English post-punk group breaking ground just two albums into their career. Second support act Charlie Collins (ex-Tigertown) has joined Gang Of Youths every night of the Say Yes To Life Tour. She and her band were just delightful. Charlie Collins’ sentimental yet fresh brand of indie rock is sure to gain her tons of fans – and, god, her voice is marvelous. Donning an acoustic guitar and using the harmonica for two songs, Charlie Collins’ talent was undeniable. Her band was incredibly solid, effectively capturing the magic of obvious influences such as Fleetwood Mac and Johnny Cash. “Mexico,” her latest single, which she dedicated to her sister currently having a rough time, had the large crowd swaying and even singing along. At the end of her set, my sister turned to me and said, “we are so seeing her next time she’s here.” My sister and I felt the same thing on Monday night: Charlie Collins is destined for greatness. If you’re a fan of Kacey Musgraves, Angus & Julia Stone and/or The War on Drugs, then Charlie Collins is one to keep on your radar. The sold-out Forum Theatre was absolutely buzzing with anticipation when Gang Of Youths strode onto the stage. Opening with the Springsteen-esque, “Fear And Trembling” was a tremendous choice – Monday night’s crowd was already in for something exceptional. Dave Le’aupepe began the song solo, only with his acoustic guitar. He was greeted with deafening applause and cheers, and the first of many crowd sing-alongs. Following the first verse, all hell broke loose: the full band charged in, the crowd sing along grew somehow louder, and everyone began dancing. The band immediately followed “Fear And Trembling” with the equally blistering, “What Can I Do If The Fire Goes Out?.” Again, it was pure madness. I’ve never seen such an enormous reaction from a crowd. Every member of Gang Of Youths shone that night. Le’aupepe’s voice was silky smooth. He often boogied towards guitarist, Joji Malani, sharing overjoyed grins. Jung Kim is an understated star on the keys. The rhythm section was also incredibly tight, with bassist Max Dunn holding songs together and providing a further layer of vitality, while Donnie Borzestowski crushed the drums for 90 minutes straight with the power Gang Of Youths are renowned for. With Le’aupepe’s honeyed vocals, long curly brown hair, cheeky smile, and sometimes-ridiculous dance moves, he’s already a superstar. Perhaps even a spiritual successor to the dearly missed INXS frontman, Michael Hutchence. After only two songs, Le’aupepe greeted us. Most importantly, he made sure to remind us all that: “everyone in this room should be comfortable. Look out for the people around you and take care of each other.” He didn’t have to say anything of the sort. But, as a young woman in the crowd looking out for my younger sister, it was comforting to hear that Gang Of Youths cared for every single person in the packed theatre. Of course, a majority of Gang Of Youths’ setlist comprised of their latest album, Go Farther In Lightness. However, nothing could’ve prepared me for the beautiful three-song-punch of “Keep Me In The Open,” “Do Not Let Your Spirit Wane,” and “Persevere.” Proving to be a genuine, down-to-earth frontman and individual, Dave Le’aupepe left us with some deeply honest monologues before both “Do Not Let Your Spirit Wane” and “Persevere” – about the experience of being labelled an atrocious band to see live, and of his family’s struggles before he was even born. Then, prior to “Persevere,” every band member except Le’aupepe left the stage. He sat by the grand piano and delivered such an intimate, stunning rendition of the song, that I currently struggle to hear the studio version. An older woman turned to me after “Persevere,” remarking how the men around her were “in their feelings.” She wasn’t wrong. Whether Gang Of Youths are capturing hearts with lovely ballads or inspiring thousands to rally against negativity with rip-roaring rockers, the result is the same: a Gang Of Youths concert isn’t simply another gig. It’s a life-changing experience. Go Farther In Lightness is only just over a year old. You wouldn’t know it by the rapturous sing-alongs witnessed on Monday evening! What might be the best thing about seeing Gang Of Youths live is simply watching everyone around you, and from my field of vision, here were some of my favourite unbridled moments: two teen girls singing smash-hit, “Let Me Down Easy” to each other, holding hands; a 20-something-year-old man resembling The 100’s Richard Harmon on someone’s shoulders, gleefully throwing his arms at the band during “The Heart Is A Muscle”; a 40-something-year-old man yelling at the top of his lungs for the chorus of devastating breakout hit, “Magnolia”; and beautifully, a group of four strangers with opposite ethnicities, arms around shoulders, chanting along to the refrain of “Say Yes To Life”. It was a night of exuberance, acceptance, and diversity; which is what Gang Of Youths have always been about. Four years ago, Dave Le’aupepe was in the darkest place he’s ever been in. He has expressed immense gratitude towards his bandmates for helping save his life. A huge portion of Gang Of Youths’ debut album, The Positions, tracked the tragedy that plagued him at the time. See “Magnolia,” the precise recollection of the night Le’aupepe would attempt to take his life. “Magnolia” could have easily been a song that dwelled on the darkness; Le’aupepe could have given up. But, he didn’t. On Monday night, he dove into the loving arms of the audience, all of us celebrating life with him. 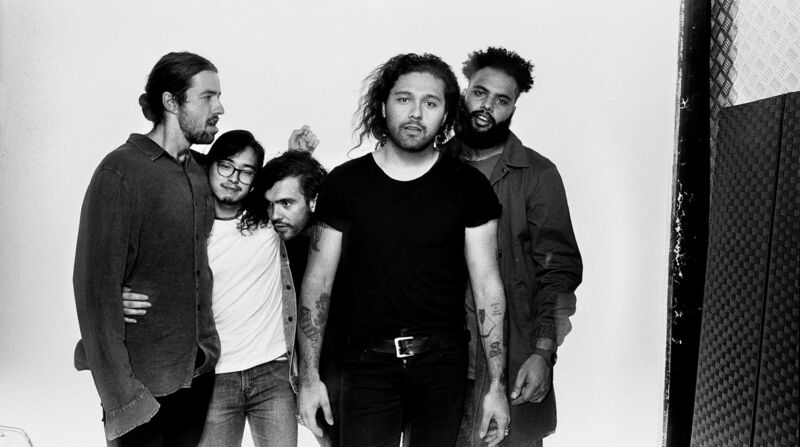 “Magnolia” was one of the first of several songs where Gang Of Youths would revere in making the most of life, setting the path in which the band has continued to follow. What I witnessed when I finally saw Gang Of Youths live a few nights ago was more than a concert. I’m fully aware that I was in the presence of a band poised to take the mantle from epic rock acts (who the band happen to be influenced by), such as Bruce Springsteen, INXS or U2. Gang Of Youths already have an incredible repertoire of ginormous rockers, as well as gorgeous, wholly unique ballads. What every sold-out audience beheld over the Say Yes To Life Tour is a fully-formed band. Love them or hate them, something I’m entirely sure of is Gang Of Youths are here to stay. Soon enough, the world will experience what thousands of Australians have during this tour: two hours of unadulterated bliss and walking out of iconic venues, gobsmacked. I can’t wait to hear more stories like mine.